In 'Titus Andronicus' Troubleman have found themselves a great (if surprisingly straight) indie rock band. This New Jersey quintet don't sound nearly as despondent as some of their song titles may suggest: both 'No Future Part One' and 'No Future Part Two' carry a suggestion that there's something genuinely uplifting and special about this band, regardless of whatever superficial gestures towards misanthropy might litter the album. Some of this stuff could have come from the Arcade Fire book of epic songwriting, with album closer and single 'Albert Camus' sounding not entirely unlike a rowdy Win Butler sing-along. 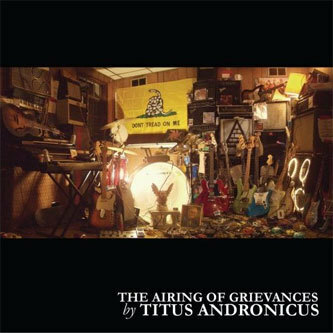 The band would probably hate that sort of comparison, and sure, there's something more resolutely underground about Titus Andronicus, but beneath that surface veneer of slightly sloppy recording and howled vocals you'll find a band that's a lot easier to love than they might have you believe. Awesome.